Perseverance is steadfastness in doing something despite the difficulty. Persistence is the ability to be determined to do or to achieve something regardless of any setbacks that are encountered. Both are very similar, and can help you achieve your goals with some practice. Working towards getting your labs within range or maintaining your fluid restriction can seem daunting. But, with a persistent attitude, you can achieve your goals. Doing all of the things you can do to stay healthy on dialysis may not be easy, but it is important. Patients who persist in meeting their goals are not put off by setbacks. They consistently make their health their priority and they are not put off by obstacles. Developing persistence is the path to success. Dealing with the added stress from having kidney disease is a challenge. In addition, family members and caregivers are impacted. 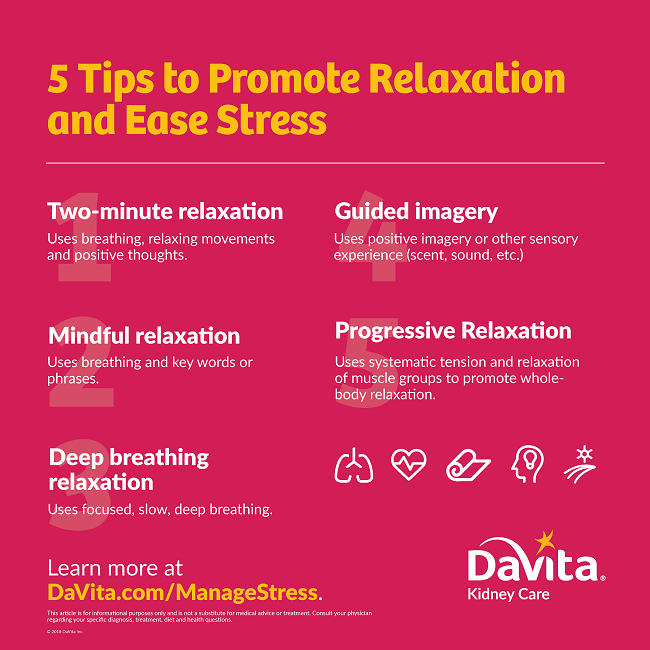 The DaVita.com article “Caregiver Stress and Chronic Kidney Disease” by DaVita Social Worker Marylynn Tackett offers some great suggestions for dealing with stress. It may be easier to ignore your dietary restrictions or to miss a treatment without making it up, but if you want to take control of your health, here are some ways to help you develop persistence. Before you can develop persistence and eventually achieve success, you need to first identify your goals. What do you want to achieve? You can do this by simply writing down your goals. It may be the ability to maintain your phosphorus level, or to avoid high potassium foods, to adhere to your treatment schedule or to stay within your fluid restriction. List all of your goals, no matter how difficult you think they will be to achieve, so that you have a starting point. If the list appears to be too overwhelming, narrow the list down to one or two items and start there. Motivation comes from a deep reason why we want to achieve or have something. If you know why you’re doing what you’re doing, it gives you more energy to keep moving. Everyone’s motivation is different and what motivates one person may not motivate another. Not reaching our goals is often due to not having a motivation firm enough to drive us to work on achieving our goals. 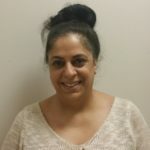 Although adhering to all of the rules and restrictions of dialysis is difficult, understanding what motivates you can be the necessary factor that can lead you to your goal. Is your motivation to be healthy enough to enjoy your grandkids? Or to be able to walk or take the stairs without being winded? Is it to stop the itching caused from elevated phosphorus? Or is it to simply feel better? You have to decide what motivates you personally in order to make the transition to a healthier you. So first you identified what you want to achieve. Then you determined your motivation to show the reason(s) why you want to achieve what you want. Now it’s time to outline your definite action step in order to figure out how you will be able to achieve what you want. When you know how to get what you want, it makes your goal easier to achieve. Talk to your dialysis team about specific steps you can take to achieve your goal. Be upfront about what you want and where you have difficulty in achieving your goal so that you can work out a plan that suits you. Planning is a key step in attaining your goals. The “how’s” don’t have to be elaborate plans but rather taking simple steps to adjust your habits. For example, your one time plan may be to drink less during the day so you can enjoy an extra beverage at a party in the evening. Talk to your host before the party to insure kidney-friendly food will be available. A continued plan may be to create a grocery list so that when you are at the store, you will be less tempted to stray from your restrictions. Another continued plan might be to put your binders next to your plates so when you get a plate to eat, you remember to grab your binders. The road to success always has its challenges. There will be countless times you will be faced with a temptation that you know is not a positive decision for your health, so acknowledging ahead of time the bumps you will face in reaching and maintaining your goal may help you to make the healthier choice. In order to develop persistence and eventually succeed in your endeavor, always maintain a positive mental attitude, regardless of situation. Keep your thoughts focused on taking action towards your goals. Avoid negative thoughts and feelings because they may ruin your concentration and persistence. Ask other patients who are successful in maintaining their health status how they do it. Log onto DaVita.com to find recipes and information as well as discussion forums with other patients to discuss strategies that are working for them. Try to avoid negative talk with other patients who may be struggling or family members who are not supportive. Stay positive. All of your goal-setting and planning will go to waste if you won’t be able to develop discipline and good habits. Good habits are attained, just like bad habits. We are not born with habits, they are learned. Therefore unhealthy habits can be unlearned to make way for positive ones. Upholding discipline and good habits can help you stay on the course, despite any challenges you may face along the road to a healthier you. The effort is worth it. One thing you can do is determine how much potassium you are having from your diet. Use DaVita Diet Helper to track your food intake and share the results with your doctor. There are other causes of high potassium–medications and constipation may contribute.